We decided on good ole Apple Pie for Thanksgiving but, you know me and typical. Instead of the usual fussing with pie crust, I’m doing a version of Apple Tart Tatin using puff pastry. And, because I can’t leave well enough alone- I added pecans. Toss cut apples with lemon juice. In a large ovenproof skillet melt the butter over medium high heat. Add the sugar and stir for 3-5 minutes until the sugar mixture is a golden caramel brown color, but still somewhat grainy in texture. Add the apple slices and cinnamon, stirring well to coat each slice. Reduce the heat to medium and cook for 10 minutes, uncovered, stirring often. Add in the pecans and a pinch of salt. Cover and cook 10 minutes longer. Remove pan from the heat and let cool slightly. Roll the sheet of puff pastry out until it’s large enough to cover the 10-inch skillet. Arrange the apple slices in a decorative circular pattern in the bottom of the sauté pan. Place the circle of puff pastry over the apples and tuck the excess dough down inside the pan. Bake for 12 minutes, until the pastry is golden brown, puffed and crispy. Within 5 minutes of removing from the oven and using oven mitts, carefully invert the pie onto a large serving plate. The caramel sauce is very hot, so be careful not to get it on yourself. Serve the pie hot with vanilla ice cream. Oeufs Mollets Avec Épinards Mornay – The name is all fancy sounding but this is just soft boiled eggs over a bed of spinach and covered in a rich, cheesy sauce. The original is à la Florentine, meaning it is served over cooked spinach, which I detest. So instead, I serve it over fresh spinach leaves. It makes a great brunch meal or, in our case, a luxurious dinner. This recipe also supposedly caused Julia Child to failed at Le Cordon Bleu because she forgot that oeufs mollets meant soft boiled eggs. 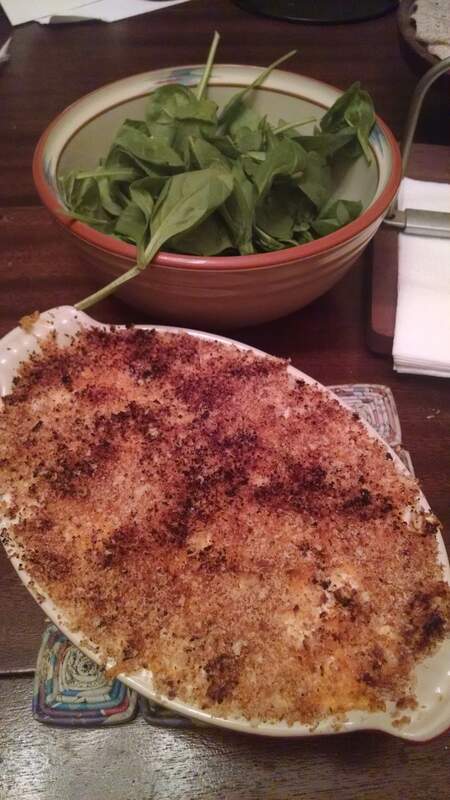 The eggs tore a bit when I shelled them, so the picture is of the golden browned breadcrumbs in the gratin dish plus the heaping amount of spinach. Trust me, the eggs are under there! Melt the butter with the flour in a small saucepan to make a light roux. Stir for 5 minutes over medium heat before slowly whisking in the milk. Season the sauce with salt, pepper and nutmeg. Slowly add the cream to the pan and cook until thickened, about 10 minutes. Sprinkle on the cheese, stirring constantly until melted. Meanwhile, bring water to boil and place in the eggs. Cook for 5 minutes for soft boiled. Remove to an ice bath and, as soon as you can safely handle them, carefully peel them without breaking them. I find peeling them under running water can help get the shell off more easily. Coat a gratin dish with butter. Place the eggs in the gratin and pour the sauce over. Sprinkle on cheese and breadcrumbs and place under the broiler. Keep an eye on it but in a couple of minutes it should be golden brown and done. Wash the spinach and drain well. Place on the plate and spoon over the eggs and cheese. Devour! You notice that no where do I call this a salad! Regular readers of my blog know my philosophy is that salad is what dinner had for lunch. Whatever you call it, this dish is easy elegance and darn tasty to boot! I love the flavor that herbes de Provence brings to chicken. Add some lemon juice and lemon salt (made with the zest) and you’ve got a delicious Sunday night dinner. You can make your own (here is Martha Stewart’s recipe) but I’m a big supporter of Penzys Spices (here is the link to buy theirs). Read this great letter from them on Cooking trumps Racism. Bring two cups of water to a boil with the sugar, salt and herbes de Provence. Remove from heat and stir in 2 cups of ice cubes to bring the temperature down. Mix with the quart of strong tea. Pour over chicken and brine for 2 to 4 hours. Combine olive oil, lemon juice and herbes de Provence and coat entire chicken.Take lemon zest and mix it with the kosher salt. Set chicken breast side up in roasting pan and sprinkle with the lemon salt. I covered the bottom of the pan with small Yukon gold potatoes (and some larger ones cut in half) and rested the chicken on them so they kept the chicken off the bottom and cooked with the chicken. Bake at 400 degrees F for 15 minutes per pound. With the chicken open like this, it takes about an hour but may take 75 to 90 minutes. At an hour, check the internal temperature (thighs should be at 165 degrees F) and tent with foil if the skin is getting too dark. Don’t seal tightly or the skin won’t stay crispy. Continue cooking until done. Let rest 10 minutes before slicing. Stir potatoes around in drippings and serve with the chicken. My next door neighbor sometimes gets shrimp from a buddy of his from Plaquemines Parish. I bought a pound of very fresh shrimp off of him and then stared into the refrigerator. I had cream, butter, lemons and a huge bunch of rosemary – guess it is time to make a beurre blanc sauce. Add onion, 3 tablespoons lemon juice and limoncello to a small saucepan. Bring to a boil and reduce until you have 4 tablespoons worth. Then add the cream, rosemary and salt and pepper. Cook until the cream is reduced by half. Reduce the heat and slowly whisk in one stick of the cold butter, a few cubes at a time, making sure that they dissolve completely before adding more. When it is entirely incorporated and has the consistency of a hollandaise sauce, take the saucepan completely off the heat and whisk in the remainder 4 tablespoons of butter and final tablespoon of lemon juice. This will ensure that the sauce will stay creamy, and the butter won’t break. Adjust seasonings. While the cream is reducing, toss shrimp in olive oil and lemon juice to coat. Combine lemon zest and coarse salt. Sprinkle lemon salt over the shrimp with a few grinds of black pepper. After the sauce is made, coat the bottom of a large sauté pan with oil and heat over medium-high heat. Working in batches, add the shrimp and sear on each side until lightly golden brown, about 1 to 2 minutes per side. Remove to a plate. Sauté the artichokes in the same pan until warmed through. Set with the shrimp. 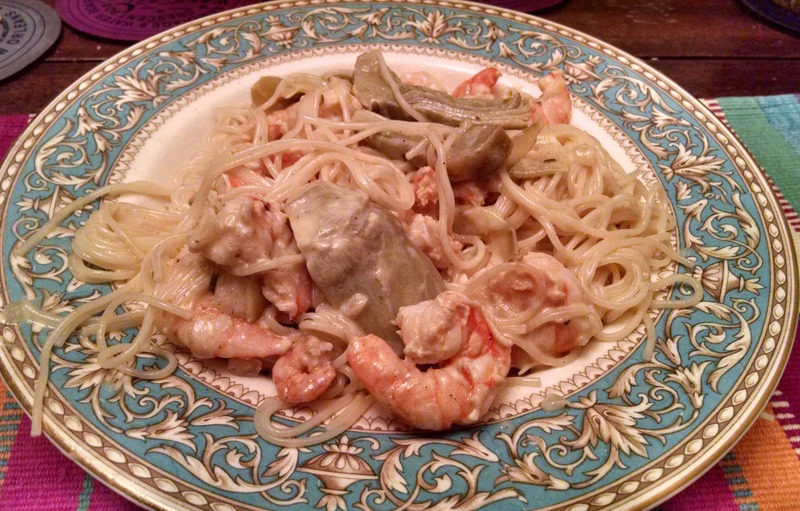 Toss shrimp and artichoke hearts with rosemary lemon beurre blanc and serve with pasta. We used angle hair pasta. This is a simple one dish meal for dinner that takes less than 30 minutes to prepare. The vibrancy of the peppers, the crunch of the cashews and the tang of the sauce all go together for fancy-feeling weeknight meal. Cook and stir peppers in 1 tablespoon of the oil in a large skillet on high heat. Remove from pan. Add remaining oil and chicken to skillet and cook until chicken cooked through. Remove from pan. Whisk together broth, mustard and cornstarch. Add to skillet and cook until thickened, stirring constantly. 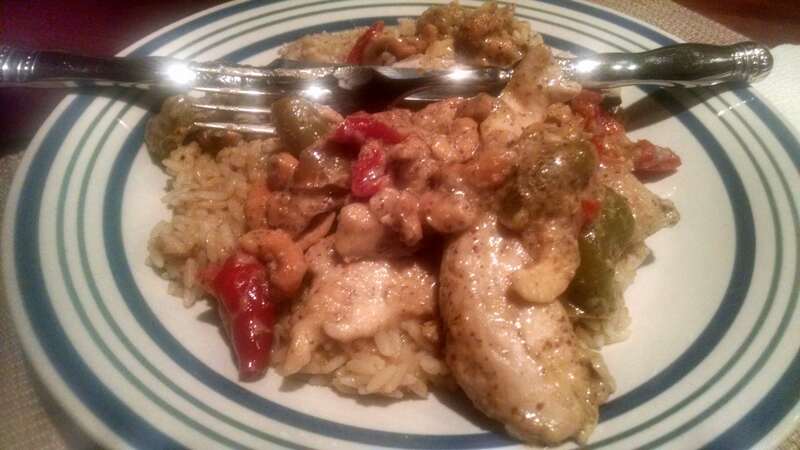 Return chicken and peppers to the skillet. Cook and stir until heated through. Stir in cashews. 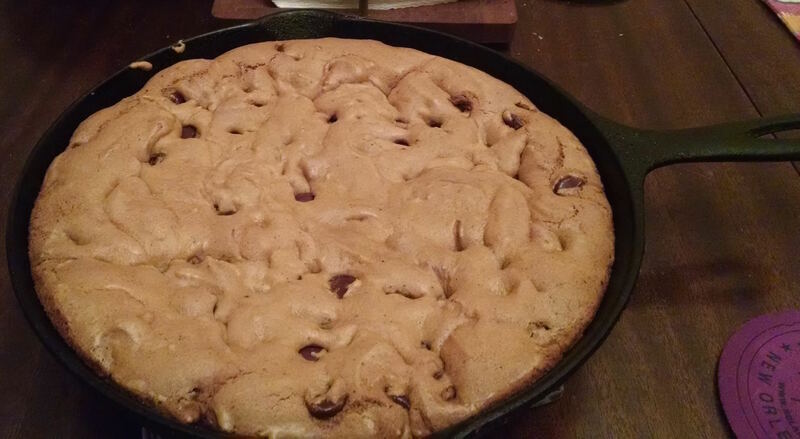 Before watching the 2016 election returns last night, I made a huge a$$ chocolate-chip cookie. Believe me, after all the campaigning and then watching the nail biting return reporting, I needed a treat with loads of gooey chocolate. I browned the butter before creaming it with the sugars. It gives the cookie a nutty taste without actually adding nuts and keeps the cookie chewy (as per America’s Test Kitchen). In a 10 inch cast iron skillet, melt butter over medium heat stirring often, until it starts to bubble and is completely melted and foaming subsides. Continue to cook, stirring and scraping the bottom of the pan until the milk solids are a golden brown and the butter has a nutty aroma. Pour the melted butter into the bowl of your stand mixer and mix together the butter and sugars. Do not wipe out skillet. Chill bowl for 10 minutes. While it cools, combine flour, baking soda and salt in a medium bowl. Once the batter is cool enough not to scramble the eggs, remove from the refrigerator and add the eggs one at a time until combined. Add in the vanilla. Stir in flour mixture. Stir in chocolate chips. Pour batter into the skillet in which you browned the butter. Bake at 350 degrees for 35 to 40 minutes or until the edges are lightly golden brown. The inside should still be slightly gooey. Top with vanilla ice cream and try not to eat the entire thing in one sitting! Michelle and I went to the tree giveaway of the NOLA Tree Project this morning, hoping to get a pomegranate tree. Alas, none were to be found (although we did pick up a pecan and a sweet olive). 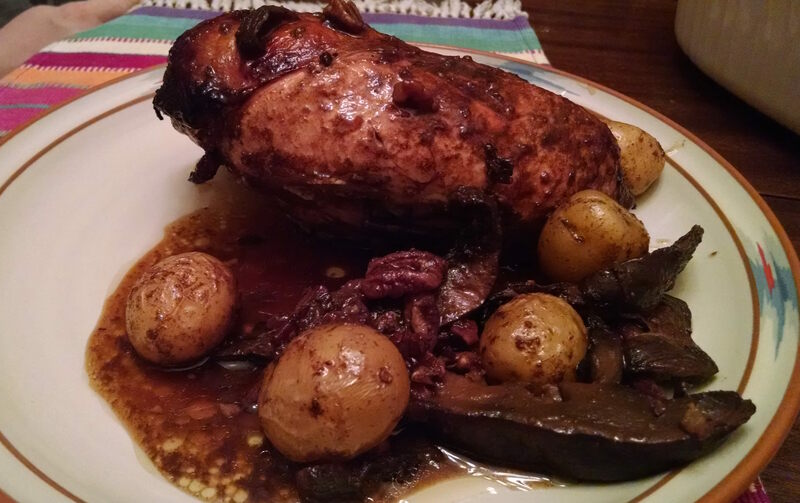 To make up for her disappointment, I fixed a chicken tonight with pomegranate molasses. While you can make your own, I bought mine at Mona’s Middle Eastern grocery and you can also find it at grocery stores with a good international section. Whisk pomegranate glaze, olive oil, garlic, salt, and pepper until combined. Pour the pomegranate mixture over chicken and let sit while you prep the potatoes, mushrooms, and pecans. After about 30 minutes of marinading, combine everything in a casserole baking dish. Bake covered for 45 minutes then uncovered for an additional 15 minutes, for about an hour total. Internal temperature of the breasts should be 165 degrees F.
As an alternative to the fingerling potatoes, omit them and serve the cooked chicken, mushrooms, pecans and pan sauce over wild rice.